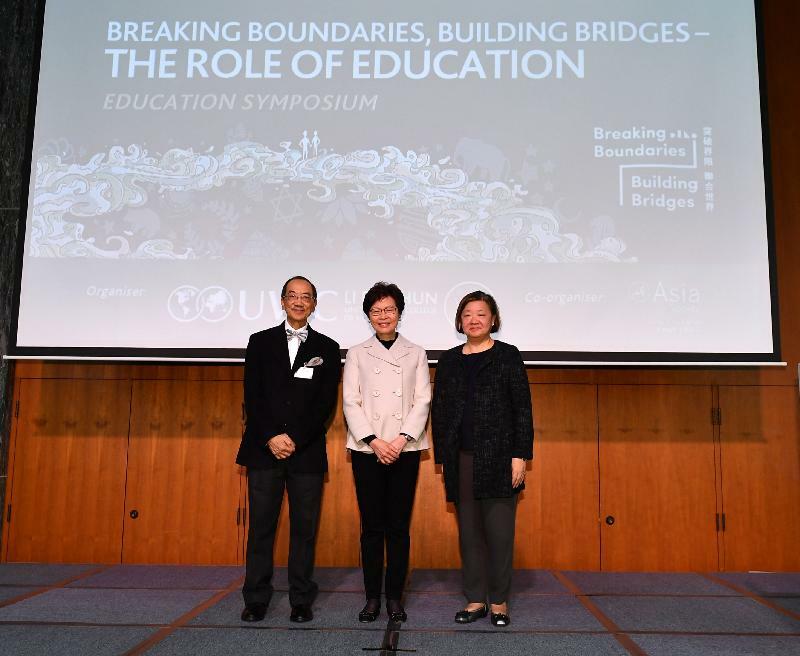 I am delighted to be here for today's Education Symposium: "Breaking Boundaries, Building Bridges – the Role of Education". 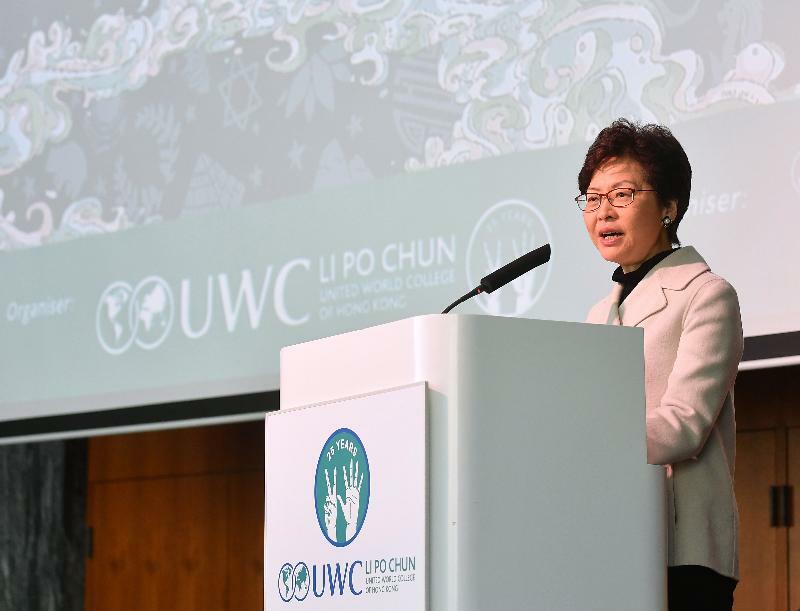 I am particularly pleased to note that today's event is part of the 25th anniversary celebrations of Li Po Chun United World College of Hong Kong. Since opening here in Hong Kong in 1992, the College of Hong Kong has followed the mission of its parent college, admitting students from all over the world and using the power of education to unite people, nations and cultures for a harmonious and sustainable future. I am glad to learn that, over the past 25 years, there have been students from 147 different countries studying in the College, creating an exceptional community. Thanks to the power of technology and the global economy, we live in an increasingly interconnected and inter-dependent world. Our young graduates must be equipped with the necessary skills, the essential confidence and connections, if they are to find their place – and maintain Hong Kong's standing – in the global economy. In this, the College is certainly exceeding expectations. Through such initiatives as the Education Outside the Classroom programme, overseas trips, China Week, cultural evenings, the College has been making remarkable efforts to deepen students' understanding of international connectedness and enhance their whole-person development. Beyond breaking boundaries, the College also continues to build bridges. We are all well aware by now of the Belt and Road Initiative, which is now supported by more than 100 economies and international organisations. All of them are keen to build bridges – the literal, as well as the metaphorical. I am pleased to note that the College is determined to be part of that multilateral future and to create its own connections to the nations, the cultures and the peoples of the Belt and Road. In fact, over the past 25 years, more than 560 students from Belt and Road countries have been admitted to the College. And now the College is moving to expand its Belt and Road links. I understand that plans are in place to set up a Belt and Road Resource Centre at the College, which will welcome secondary school students from all over Hong Kong, helping them better understand the economies, the cultures and the opportunities that the Belt and Road can offer. In addition, some of the College's service projects will take place in Belt and Road countries, and the College is working to establish a scholarship programme to welcome more students from these countries. That, ladies and gentlemen, is what I call planning for the future. My Government is also busy building bridges for the Belt and Road and for our young people in general. The Education Bureau will enhance the content of Mainland exchange programmes to enable more teachers and students to understand the opportunities brought by the Belt and Road Initiative and other national development strategies and to widen their horizon through visiting the relevant provinces and cities in the Mainland. In the 2016/17 school year, about 60 000 students benefited from the exchange. This school year, we have expanded the quota to more than 100 000 places to give every primary and secondary student the invaluable opportunity to participate in at least one Mainland programme. More generally, we are eager to help our youth realise their potential, whatever their goals may be. And I believe we can do that best through innovative, future-focused education. It is the reason why, shortly after taking office, my Government increased the recurrent expenditure on education by HK$3.6 billion a year. The additional resources cover the entire spectrum, from kindergartens and primary and secondary schools, to integrated and special education, as well as post-secondary education. At our public sector primary and secondary schools, we have raised the teacher-to-class ratio, providing more than 2 000 additional regular teaching posts. We are also offering an extra recurrent cash grant of $25,000 a month to boost innovation and technology (I&T) staffing support for e-learning and other I&T-related educational initiatives. We are, as well, bolstering our STEM education. We have updated the curriculum of the STEM Education Key Learning Area to nurture the creativity, collaboration and problem-solving abilities of our youth, thereby promoting an innovative and entrepreneurial spirit. We have also launched STEM training programmes for the heads and middle managers of our public primary and secondary schools. Additional training and teaching support are available at the STEM Education Centre, up and running since last October. At the post-secondary level, we are creating policies and programmes designed to boost our I&T talent. A recent McKinsey Global Institute study, "Jobs Lost, Jobs Gained: Workforce Transitions in a Time of Automation," notes that – and I quote – "between 400 million and 800 million individuals could be displaced by automation and need to find new jobs by 2030, around the world." So we must ensure that today's students have the knowledge, expertise and innovative smarts they need to build their future. With that in mind, some HK$10 billion has been earmarked for university research programme. And with an injection of $3 billion into the Research Endowment Fund, the Education Bureau is providing scholarships for local students admitted to Hong Kong-funded research postgraduate programmes. And I can tell you, there is a great deal more funding on the way for I&T education and research in our policy agenda. Money, of course, is only a means to realising our vision for education. With our healthy fiscal reserves, my Government is prepared to invest for our future, and there is no investment more meaningful than education. We are therefore prepared to consider any proposal to improve the quality of education, even if it means that we have to go beyond the $5 billion additional funding that I pledged last year. In my Policy Address delivered last October, I have identified eight areas of education which the Government needs to carry out in-depth reviews, including professional development of teachers, curriculum arrangement, assessment system, vocational and professional education and training, self-financing post-secondary education, school-base management, parent education and University Grants Committee's funding on research and student hostels. I am glad to report that the Education Bureau has set up task forces with the participation of educational experts and related professionals to carry out the reviews, and studies have been commissioned step by step. Ladies and gentlemen, our vision certainly embraces today's symposium theme: "Breaking Boundaries, Building Bridges." Thanks to Hong Kong's longstanding embrace of free trade and free economy, we have pushed far beyond our boundaries, connecting with economies and peoples from all over the world. It is the reason why Hong Kong flourishes today, and will continue to drive our long-term success. My thanks to the Asia Society for hosting today's Education Symposium. And my congratulations, again, to Li Po Chun United World College of Hong Kong on your 25th anniversary. With the Chinese New Year approaching, may it bring you health, happiness and the enduring joy of learning. I hope you will have a wonderful afternoon.